The High-Altitude Water Cherenkov Observatory (HAWC) is designed to study the sky in TeV gamma rays and observe the most energetic objects in the known universe. This week the collaboration published its first science result: a precise measurement of the anisotropy of Galactic cosmic rays above 1 TeV. The study was lead by members of HAWC from the University of Wisconsin-Madison and the University of Rochester. Celestial coordinates of the small-scale cosmic-ray hot spots observed by HAWC. From: HAWC Colloration. 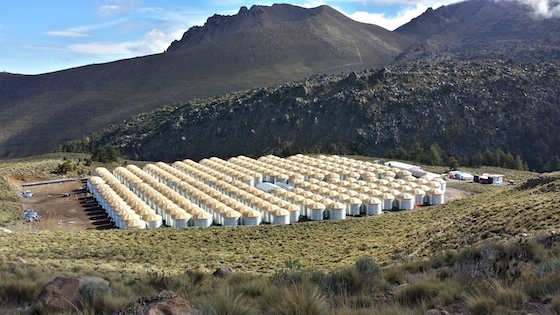 HAWC is a water-Cherenkov array designed to observe the extensive air showers produced by TeV cosmic rays and gamma rays. Located 4,100 m above sea level in Sierra Negra, Mexico, the completed observatory will comprise 300 water Cherenkov tanks, each 4.5 m tall and 7 m in diameter and containing 200,000 L of purified water. Between the start of operations in June 2013 and February 2014, the partially-deployed HAWC detector recorded close to 50 billion cosmic rays and gamma rays. With these high statistics, Daniel Fiorino and Stefan Westerhoff of UW-Madison and Segev BenZvi of the University of Rochester were able to measure a significant small-scale anisotropy in the arrival directions of cosmic rays in the TeV region. The results, presented by the HAWC Collaboration in a paper accepted for publication in The Astrophysical Journal, exhibit three regions of significantly enhanced flux, in agreement with previous measurements in the Northern Hemisphere. 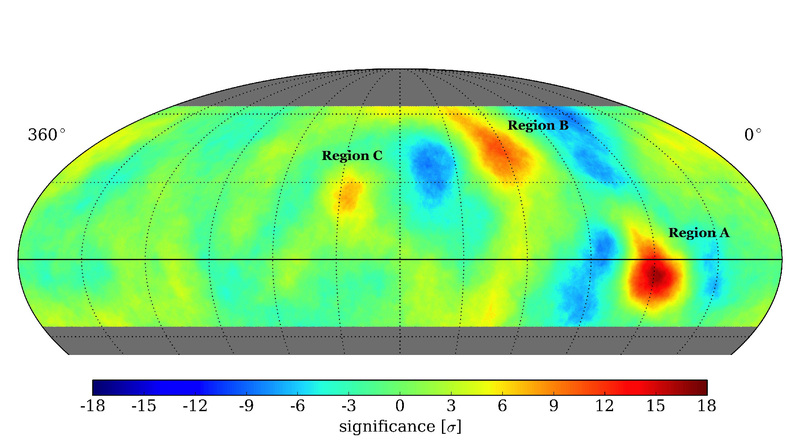 The cosmic-ray anisotropy, also observed by the IceCube Neutrino Observatory in the Southern Hemisphere, includes large-scale structures of amplitude 10-3 and small-scale 10° "hot spots" of amplitude 10-4. Although the hotspots have been observed by several experiments in the Northern Hemisphere, their origin is not known. They may be created by nearby sources of cosmic rays, turbulence in the Galactic magnetic field, or more exotic processes such as the decay of quark matter in pulsars or the self-annihilation of dark matter in the Galaxy. Reference: "Obervation of Small-Scale Anisotropy in the Arrival Direction Distribution of TeV Cosmic Rays with HAWC," A.U. Abeysekara et al. [HAWC Collaboration]. Accepted by The Astrophysical Journal, arXiv:1408.4805 [astro-ph].